Recently I looked on Ebay for strawberry seeds. It was amazing how many different colours were listed for little money and free postage. It is too bad that none of them actually exist. After reaching page five and only finding three listing for seeds that actually exist I decided to write a quick post to help buyers protect themselves. 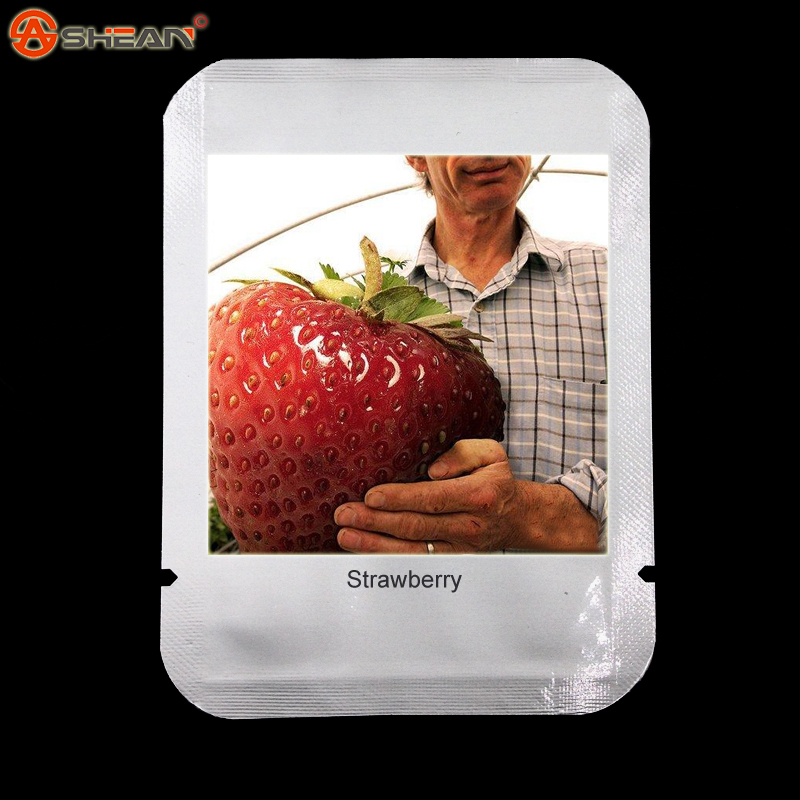 While you will be sold strawberry seeds, they will not grow into anything like you have been told they will. The legal term for this is "theft by deception", it is illegal, it is immoral, and the people involved should be ashamed of themselves. I have not bothered to complain to ebay. I know of some people who have been reporting every listing of multi-coloured blue roses (which do not exist) to ebay for years and nothing is ever done. The same sellers keep selling seed of white roses while stealing thousands of dollars from people. Ebay should be held accountable for knowingly allowing laws to be broken like this, but they aren't and they likely never will. Ebay makes a lot of money from this kind of thing, and there are no consequences for them, so it is in their best interest to allow it to continue. Please do NOT buy any of the following seeds from anyone ever. If anyone is selling any seeds of these do not buy anything from them at all as they are thieves and liars! The following seeds do NOT exist, by the time you have worked it out you have already left glowing reviews and these fraudsters have stolen your money! You will most likely be sold seed from red strawberries, if you want that please go buy a punnet from the market and save seeds from there rather than fund these thieves. Do not give money to thieves, it will only make things worse! How amazing do these black strawberries look, it seems almost reasonable for these to be real as we have blackberries etc. Black Strawberries like in this picture do NOT exist. 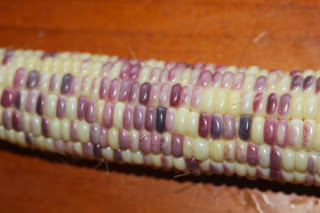 There are a few dark red varieties but nothing that looks remotely black. This picture, and many more like it, have been altered. 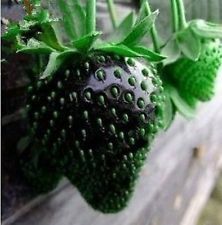 Do NOT buy seeds for black strawberries. These look amazing and the sellers often claim that they are rare which is why you have never seen them in real life. Blue strawberries like in the pictures do NOT exist! Strawberries never have and they never will look like this (unless there are massive leaps in genetic modification technology in the future). Even the GM blue strawberries which you will not have access to do not look anything like this, they are more of a red/mauve colour as we simply do not have the technology to produce these yet and the seeds are never released to home growers. 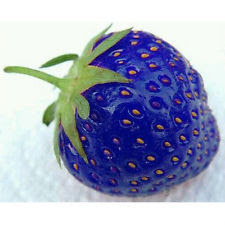 Do NOT buy seeds for blue strawberries. 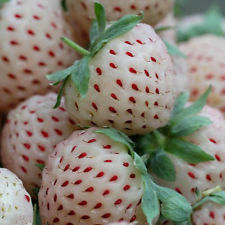 Pineberry Strawberries actually DO exist, I have a few plants myself, but they will not grow from seeds. Unfortunately pineberry are a complex hybrid of various strawberries that can only be grown by division, runners or tissue culture and not by seed. Even if the flowers are self pollinated, any seeds that are grown will NOT result in a pineberry plant and you will get a mix of different strawberries. If you want a pineberry strawberry (they are pretty cool) buy a plant from a reputable seller. If you want the weird mix of seed with which to do some breeding work do NOT encourage these ebay thieves, please buy a pineberry plant and save the seed yourself. 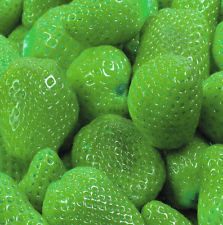 Feel free to buy plants but do NOT buy SEEDS of pineberry strawberries. Pink strawberries do exist, kind of, but they look nothing like in this picture. The colour in the picture has been deliberately modified and the description embellished to try and steal your money. Do NOT buy seeds of these. 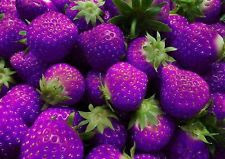 Purple strawberries like below do NOT exist. Nothing like this picture has ever existed or will ever exist. The seller is trying to steal from you. Do NOT buy seeds of purple strawberries. 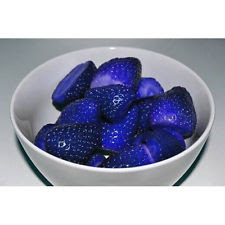 Real 'purple' strawberries are more of a dark red as per the picture below. These ones do exist but are only sold as plants and not seeds. Similar to pineberry these seeds will not produce true to type and they can only be purchased as plants. How amazing do these strawberries look! There are heaps of amazing colours here, imagine all of the nutrients that they must have. They even advertise that they are being sold by an Australian seller to seem more credible. They have a lot of positive ebay reviews and have sold many hundreds of packet of seeds so appear to be legitimate. We have thieves in Australia too, that is why you lock your car or your house when you are not there. The positive reviews are left after the seeds arrive quickly and possibly after they germinate, several months before the plants have even flowered, let alone set fruit. Once they all set red fruit it is far too late for the buyer to do anything. Some buyers complain and are fooled into buying more seeds as they think perhaps they happened to just get the red ones in their mix. It makes me mad. The colours in this picture, other than the red, do NOT exist. I hate these thieves and everyone like them. Do NOT buy seeds of multi coloured strawberries. 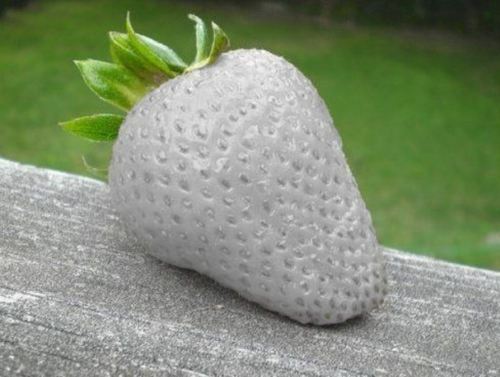 White strawberries do exist. I have eaten several different varieties, some alpine strawberries and others larger garden strawberries. Some are very bland, others are lovely and sweet. It is important to research any variety of white strawberry before you buy it. Unfortunately that makes it simple for thieves to change the colours in a photo and try to steal money from people. 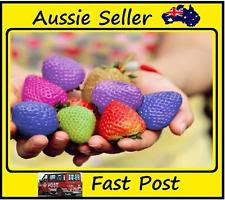 These particular ebay thieves (which call themselves AussieTown) sell a variety of different seeds, some exist but many do NOT exist. If they are happily selling some things that don't exist there is a high chance that everything they sell is not what they say it is. The picture is from an ebay listing claiming to sell "white cloud" strawberry seeds, unfortunately white cloud strawberries do not exist. Do NOT buy seeds from anyone who sells anything that does not exist. Strawberries do not have the genetic potential to ever reach this size. Even with GM technology we will never see strawberries this big. Seriously, these thieves will try to sell anything, no matter how unlikely it is. Luckily it would be simple to tell that they gave you the wrong this when the 'seeds' arrive. Do NOT buy giant strawberry seeds (or trade your family cow for magic bean seeds). Please NEVER buy ANYTHING from any of these ebay thieves. If someone lists any of these seeds for sale do not buy anything from them. Some people buy these seeds from them with the view that at worst they will at least get strawberry seeds. While true, it is wrong to fund thieves, especially when you could buy strawberry seeds from an honest person or even buy a punnet of strawberries and plant those seeds. You can get several hundred or even a few thousand strawberry seeds from a punnet of strawberries, plus you get to eat the strawberries. That is far better than giving your money to these liars and encouraging them to steal from more people. There is an old saying that if something sounds too good to be true then it probably isn't. In the plant world, especially with fruit and vegetables, this saying doesn't help. Almost everything that I grow and eat sounds too good to be true. I sell vegetable plants and seeds through the internet but am yet to use ebay. I do the right thing as I am not trying to make fast money and want people to grow my plants. That is why these thieves annoy me so much. NOTE: this is not an exclusive list, there are plenty of other fake strawberry pictures and colours that I haven't shown here but may try to add later. Pictures used in this post were copied from actual ebay seed listings. Sometimes the same pictures were used by several different sellers in different countries (grumble grumble). I've been thinking about doing such a post for some time, but I always end up feeling bad about humanity whenever I try to work on it. Thank you for your nice write-up. Thanks Darren. I also love your blog, your post about Luther Burbank crossing strawberry with raspberry is inspirational. For some reason I don't seem able to comment on your blog. I too feel bad knowing that so many people are so eager to steal from people like this. This is just the tip of the iceberg, there are so many seeds on ebay for things that do not exist. Hopefully this post helps people not to buy these fake seeds. I also hope that some strawberry collector pipes up and offers to sell me some rare strawberry seeds. There are some amazing strawberries around, unfortunately they look nothing like any of the pictures above. That reminds me that I really need to upgrade the commenting system on my blog. I think it is restricted to google+ members right now, which may explain the generally low levels of comments I get. Can you even grow strawberries from seeds? Yes you certainly can grow strawberries from seed. I have a few strawberry seedlings at the moment that I am growing out to see what they are like. 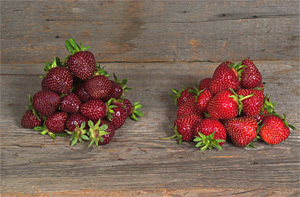 Some varieties of alpine strawberry are almost exclusively reproduced by seeds. It is also not terribly difficult to get seeds from strawberries that you buy from the market and grow them. As I mentioned, you can get hundreds, if not thousands of seeds from a typical punnet. The resulting plants would mostly not be exactly like the parent but you could potentially stumble across something even better. Well written & explanations. Now do I know. Thanks. I would avoid Amazon. If you can find any online nurseries that have a good reputation they may only list things that they have and that exist. 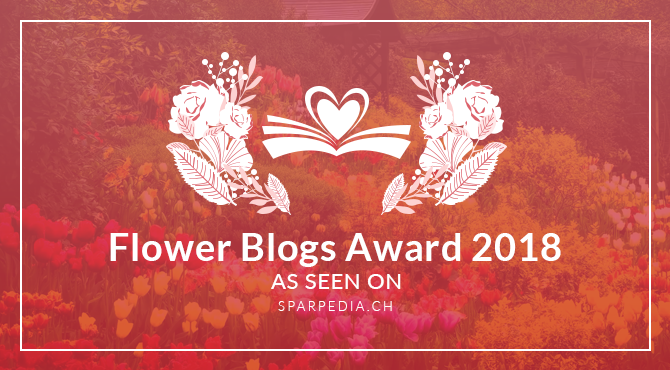 Thieves tried to steal my blog!! !